This Aquamarine and Diamond Cocktail Ring in 14K White Gold provides a mini-vacation on your finger. With a sizeable gem that calls to mind the clearest Caribbean waters and just over a third carat of diamond accents, this ring is refreshing and sophisticated, with a simple yet bold design that instantly catches eyes. 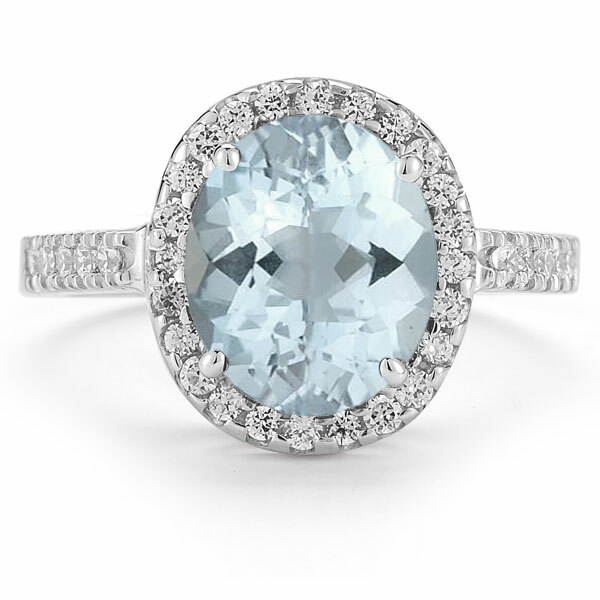 Serving as the centerpiece of this striking ring is a glittering oval-shaped blue aquamarine, 10mm high and 8mm wide, that gives this piece a big splash of lively glimmer. The very word "aquamarine" comes from two words meaning "water" and "sea," and it's easy to see how this gem got its name. Its hue really does resemble that of cool, clear waters, and its sparkle is reminiscent of sunlight reflecting off of the waves. A total of 34 small round diamonds accompany this ring's vibrant center gem. 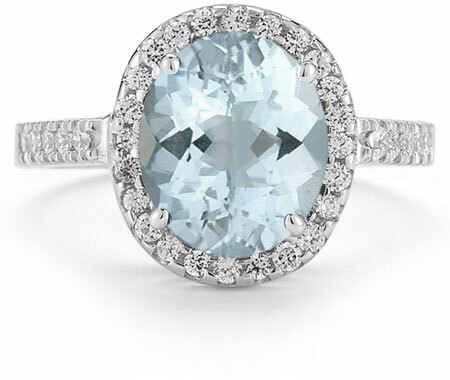 Surrounding the aquamarine are 24 of these stones that form a glittering frame that contrasts its blue hue. On either side are five additional diamonds that glitter as they sit in the smooth, shining 14K white gold band. With its perfect combination of colorless dazzle and a single, bold blue stone, this is a sophisticated ring that's always ready to take your look up a notch. We guarantee our Aquamarine and Diamond Cocktail Ring in 14K White Gold to be high quality, authentic jewelry, as described above.